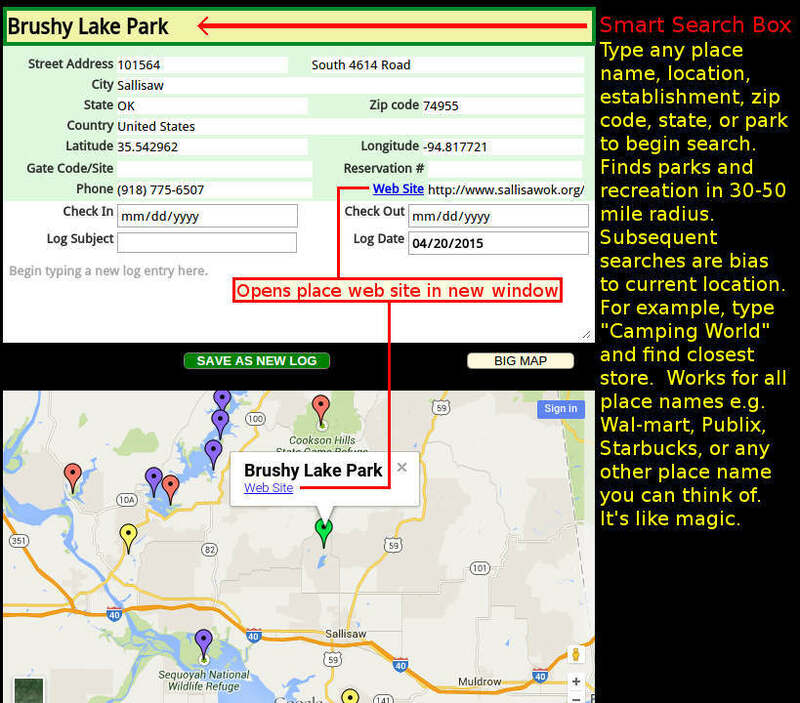 Parks and campgrounds search provides links to reservation web sites and phone numbers. Convenient fields are provided to record your reservation numbers, gate codes, site numbers, checkin and checkout dates, etc. Click the SAVE AS NEW LOG button to save to your personal camp log list (see example log screens below). You may edit provided place names and contact information to whatever you would like for personalized trip logs. TIP: Saving a log with blank Check In and Check Out dates will automatically display the log in the Future Logs section as pending. Great for planning future trips or saving locations that you are interested in exploring at a later date. TIP: Allowing CampLogger to access your location when your first visit the web site will cause the map to automatically display with your current location and markers populated for parks and campgrounds near your current location. Also, be sure to allow popups for CampLogger.com so that your browser can display the BIG MAP in a new tab, as well as allowing multiple search windows to be open at the same time. Great for switching back and forth between screens while planning a trip. Camplogger does not track, or store your location for any other purposes. An interactive personal log book of your camping trips. Trips are sorted in two sections (Future & Past) with most recent logs first. In this example, the date is April 20, 2015. Notice how logs with no Check In or Check Out dates display as pending. The Brushy Lake Park log in this example will automatically move to the Past logs section on April 25, 2015. TIP: You can display your camping log entries in diary format (see example below). Grab a cup of coffee and reflect on previous camping memories. You can associate a specific photo album to each log by opening the log and clicking Pictures in the log editing screen. An electronic checklist that can be customized and saved as personal checklist. A handy comprehensive template is provided to get you started. 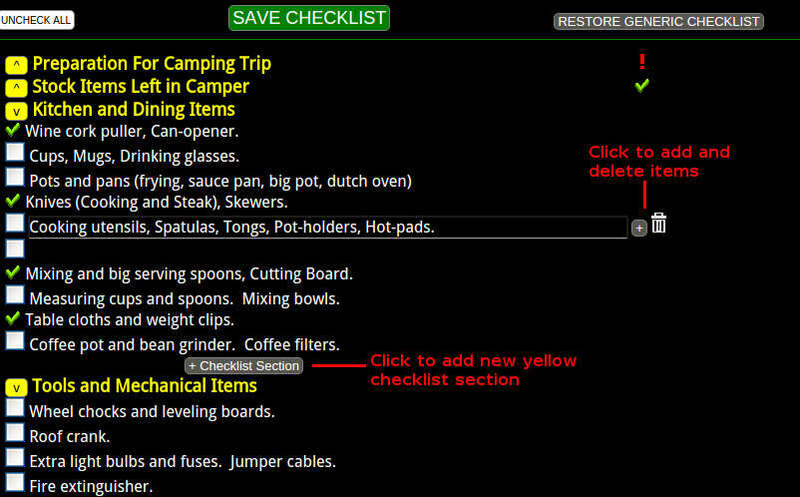 To revert a customized list back to the original CampLogger template, just click the Restore Generic Checklist button, and then click Save Checklist. TIP: A red exclaimation point pops up after section headers when folded up if there are un-checked/un-completed items in the section. A green checkmark appears when the checklist section has all marks checked/completed. Use the yellow buttons at the beginning of each section header to fold/unfold sections. Search and buy tickets for public events, shows, and fun happenings that are in the area and date range of your trip. Events for your selected location and date range are displayed automatically. Change the locations and dates to find tickets in any location you would like. Events search range is a 50 mile radius of selected location. 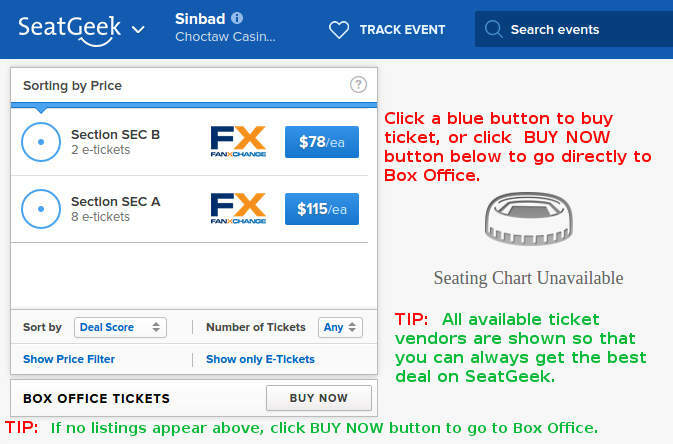 TIP: If you do not see tickets listed on the SeatGeek web site, just click the BUY NOW button near the bottom of the screen to go directly to the source Box Office. 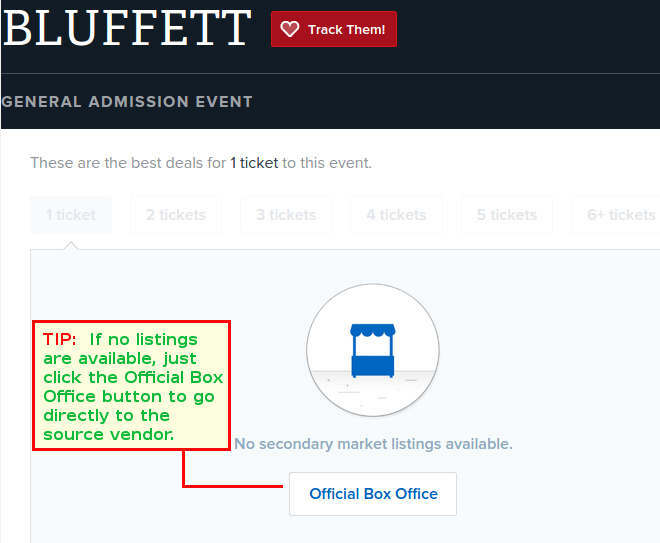 If you do not see a BUY NOW button, then there are no tickets available, the event has been canceled, or the event date is still "To Be Determined". You can click the Track Event button at the top of the SeatGeek page to be notified of future changes to the event. See example screen below. TIP: Some mobile browsers will not display listings by default. If this is the case, just click the ReFresh button to display current location and date range listings. TIP: You can search for tickets in a different location in the Events screen by simply erasing the text in the big yellow search box and start typing any other place name, location, zip code, venue, etc. and display event results for that location and date range. CampLogger.com does not save any of your personal Google account data. When you share your location with CampLogger.com, it is only for the purposes of displaying maps of your current location and search results that are relevant for your current location. We do not save your location or share or use any location information with any other parties. All authentication services to save personal items such as logs, diaries, and checklists is done through Google Secure Authentication tokens so that we do not have direct contact with any of your account information. Our website is built on Google Sites secure web architecture so that you can be assured that your data is kept secure, private, backed up, and served to you quickly and efficiently. CampLogger.com will only provide links to secure services that you can trust.